Weapons are cool. With swords, hammers, spears, axes, and everything in between, there’s always some kind of weapon that matches a characters style. What happens when the weapons are tired of doing a character’s dirty work, though? What if weapons all suddenly decided to fight back against their wielders and set out on their own, working with their kin? Well, I would assume it would look something like the living armory. A mass of weapons of all types whirls about, spinning around a central weapon. The central weapon floats effortlessly, seemingly commanding the rest of the weapons around it. Hidden Arsenal (Ex) As a full-round action, a living arsenal can animate or drop out of the air, appearing as an array of ordinary weapons within its normal space. This functions as the freeze universal monster rule. Living Whirlwind (Ex) The weapons of the living armory are in constant motion, creating a dangerous vortex. Creatures may enter any space that the living armory occupies, but doing so deals the living armory’s vassal weapon damage automatically. A successful DC 15 Reflex save halves this damage. The damage continues every round that the creature remains within the living armory’s space. The save DC is Constitution-based. Sunder Vulnerability (Ex) The ruling weapon of the living armory is vulnerable to attempts to sunder it. Sunder combat maneuvers resolve against the living armory’s AC and not it’s CMD. Any damage dealt by the sunder maneuver directly deals damage to the living armory’s hit points, ignoring DR. Weapons (Ex) A living armory is composed of dozens of animated weapons orbiting a central weapon known as the ruling weapon. Melee attack rolls against the living armory can only succeed if the attacker is threatening the center square of the living armory’s space. Ranged attack rolls receive a –4 penalty but otherwise resolve normally. Spells and other abilities that target a single creature or an area are unaffected. The living armory can change which weapon type is the ruling weapon as a swift action. The remaining weapons are known as vassal weapons and include a variety of different weapon types. Attacks from vassal weapons are always treated as bludgeoning, piercing, and slashing damage. When defeated, the living armory’s weapons can be collected and used as typical weapons of their type. 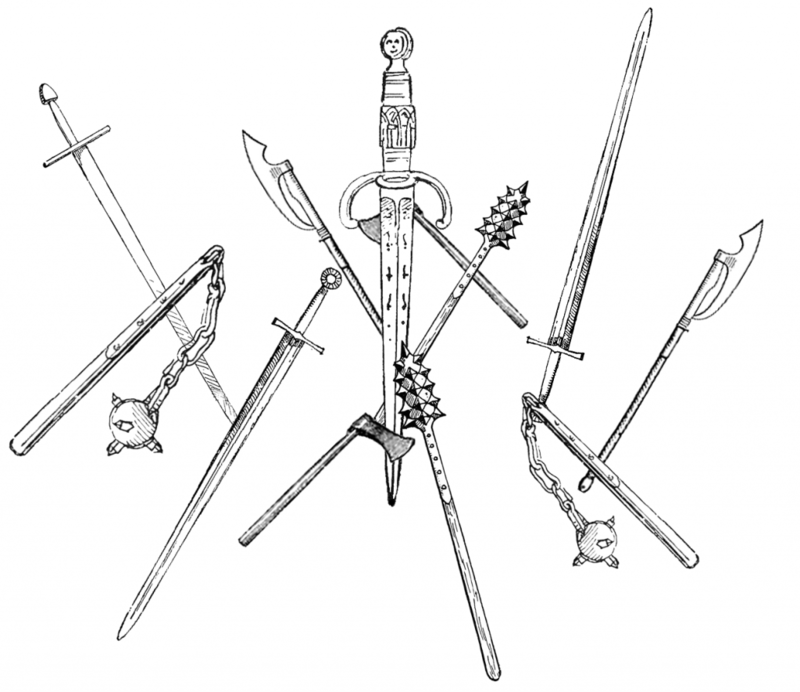 A typical living armory is composed of 10d4 random weapons. 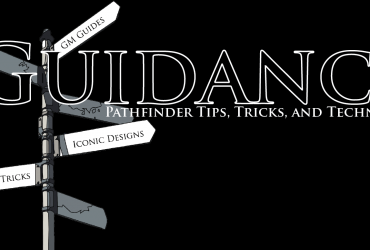 (See “Table 7–13: Random Weapons” in Appendix 1 of the Pathfinder Roleplaying Game: Ultimate Equipment.) The ruling weapon is treated as a +1 weapon of its type, 1d6 of the vassal weapons are masterwork weapons, and the remaining weapons are ordinary. Living armories are collections of weapons infused with animating magic. These constructs are generally used as guardians for great treasures or more precious weapons. Most who encounter a living armory first encounter seemingly ordinary weapon racks before facing a whirlwind of death. While most living armories are seen in keeps, they are occasionally seen on battlefields as a way of dispatching large groups of infantry at once. The creation of a living armory is relatively simple. A minimum of 10 weapons are required. Of these 10 weapons, at least three must be masterwork and one must be enchanted with a +1 bonus or better. The higher the enhancement bonus to the weapon, the more powerful the ruling weapon becomes. A living armory blocks the PCs path. During their fight, the PCs learn that the ruling weapon is intelligent and must decide between destroying or sparing the weapon. If spared, the weapon continues to harry the group, making its possible redemption all the more difficult. Weeks after the end of a terrible war in a nearby battlefield, the weapons of the dead are regrouping, ready to fight once again. Dozens of living armories approach the nearby settlements, attacking and razing all that they cross. The PCs must fight back against the army that never tires to find who or what is animating these weapons once more. The guardian of an important treasure or magic item is no longer functioning. The ruling weapon of a living armory is missing and the PCs are tasked with locating it, only to find it has become the centerpiece of some other armory. There are very few monsters that give treasure immediately upon their defeat. Most of the time, those that do provide very simple treasure. I thought it would be great to have a monster that is nothing but treasure waiting to be earned. It’s not as simple as just showing and receiving loot, however. This treasure must truly be earned. So became the living armory. The direct inspiration for this is the Ruler Sword from the Castlevania series. This large sword is surrounded by a spinning ring of other weapons and continually attempts to attack the protagonist in its defense of Dracula’s castle. In the games, the weapons are animated due to the actions of a poltergeist, but I decided a construct works better for Pathfinder. With the change to construct, it even allows for a character to make a living armory of their own! That’s it for this week! Please let me know what you think. I’m interested to hear if people would like more extra rules (such as the construction rules) with their monsters. Perhaps monster feats or new spells or subtypes? If you end up crafting your own living armory or you have any request for a future Monstrous Physique, please drop me a line at KnowDirection@hotmail.com.